matrixcardsolutions.com are pleased to announce they are now able to supply contactless payment systems on either the mastercard or visa networks. Contactless prepaid credit cards differ from regular prepaid credit cards in the way the information is read from them by the card reader. A regular prepaid credit card stores its data on a magnetic stripe that must be physically swiped through a card reader or on a microchip which must be inserted into a Chip & PIN device. A contactless prepaid credit card, on the other hand, stores its data on a microchip embedded in the card's plastic. The microchip is fitted with a radio antenna that is capable of transmitting the card's data to a card reader without physical contact. Using radio frequency identification (RFID) technology, a contactless prepaid credit card can transmit data to a special RFID card reader when the cardholder waves his card within a few inches of the receiver. Presently, contactless prepaid credit cards are only accepted at select convenience stores, gas stations, movie theatres, and fast food restaurants. The drive behind the contactless card movement is to persuade consumers to use plastic conveniently at places that have traditionally been cash-intensive. Doing so would speed transaction times and reduce lines. While few merchants accept the contactless payments right now, the technology is expected to catch on soon widespread rollouts are predicted in the years to come. Contactless prepaid cards offer huge benefits to venues such as stadiums, as they have the potential to remove cash from the stadium environment, which is a major time and money overhead. 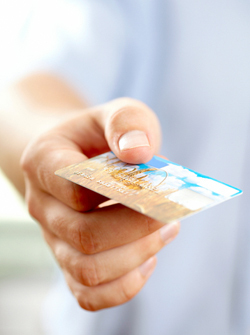 a Contactless transactions under �10 do not require a signature or PIN. b Faster than cash: Merchants can handle more customers in less time. c Consumers like the speed and convenience of contactless payments. They no longer need to insert PIN or swipe their cards or carry cash for lower value transactions. d Increase transaction volumes by capturing transactions typically made using cash. e Differentiate your company by offering innovative new form factors (watch, fobs, etc) to enhance loyalty and retention. f Contactless payment cards are backed by the major payment brands (MasterCard and Visa). g Faster check-out time: Ideal payment solution for retail segments where speed and convenience are critical. h Customers no longer limited to cash on hand and are more likely to return to merchants that accept contactless cards. j reduction of staff costs.